A man should take to himself no discomfort from an opinion expressed or implied by his adversary, but it is difficult, and oftentimes humiliating to attempt to justify the kindness of one's friends. Anybody can be nobody, but it takes a man to be somebody. Every solitary one of these aristocratic conspirators and would-be murderers claims to be an arch-patriot; every one of them insists that the war is being waged to make the world safe for democracy. What humbug! What rot! What false pretense! These autocrats, these tyrants, these red-handed robbers and murderers, the "patriots," while the men who have the courage to stand face to face with them, speak the truth, and fight for their exploited victims-they are the disloyalists and traitors. If this be true, I want to take my place side by side with the traitors in this fight. I am guilty of believing that the human race can be humanized and enriched in every spiritual inference through the saner and more beneficent processes of peaceful persuasion applied to material problems rather than through wars, riots and bloodshed. I can see the dawn of a better day of humanity. The people are awakening. In due course of time they will come into their own. I may not be able to say all I think, but I am not going to say anything I do not think. If I were hungry and friendless today, I would rather take my chances with a saloon-keeper than with the average preacher. If the people would but analyze the human equation of a prison they might better account for the crimes that are visited upon them in cities, towns, and hamlets, ofttimes by men who graduated with an education and equipment for just that sort of retributive service from some penal institution. If you go to the city of Washington, you will find that almost all of those corporation lawyers and cowardly politicians, members of congress, and mis-representatives of the masses claim, in glowing terms, that they have risen from the ranks to places of eminence and distinction. I am very glad that I cannot make that claim for myself. I would be ashamed to admit that I had risen from the ranks. When I rise it will be with the ranks, and not from the ranks. Some go to prison for stealing, and others for believing that a better system can be provided and maintained than one that makes it necessary for a man to steal in order to live. The American people can have anything they want; the trouble is, they don't know what they want. The economic owning class is always the political ruling class. The issue is Socialism versus Capitalism. I am for Socialism because I am for humanity. We have been cursed with the reign of gold long enough. Money constitutes no proper basis of civilization. The time has come to regenerate society- we are on the eve of universal change. The master class has always declared the wars; the subject class has always fought the battles. The master class had all to gain and nothing to lose, while the subject class has had nothing to gain and all to lose- especially their lives. They tell us that we live in a great free republic; that our institutions are democratic; that we are a free and self-governing people. That is too much, even for a joke. Those who produce should have, but we know that those who produce the most- that is, those who work hardest, and at the most difficult and most menial tasks, have the least. Thousands of years ago the question was asked; 'Am I my brother's keeper?' That question has never yet been answered in a way that is satisfactory to civilized society. Yes, I am my brother's keeper. I am under a moral obligation to him that is inspired, not by any maudlin sentimentality but by the higher duty I owe myself. What would you think me if I were capable of seating myself at a table and gorging myself with food and saw about me the children of my fellow beings starving to death. Debs' speeches against the Wilson administration and World War I earned the enmity of President Woodrow Wilson, who later called Debs a "traitor to his country." On June 16, 1918, Debs made a speech in Canton, Ohio urging resistance to the military draft of World War I. He was arrested on June 30 and charged with ten counts of sedition. 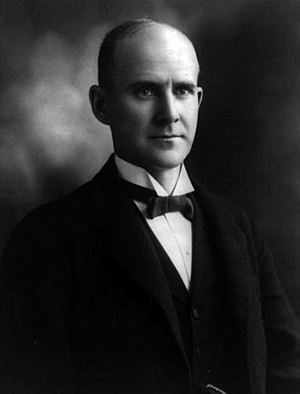 His trial defense called no witnesses, asking that Debs be allowed to address the court in his defense. That unusual request was granted, and Debs spoke for two hours. He was found guilty on September 12. At his sentencing hearing on September 14, he again addressed the court, and his speech has become a classic. Heywood Broun, a liberal journalist and not a Debs partisan, said it was "one of the most beautiful and moving passages in the English language. He was for that one afternoon touched with inspiration. If anyone told me that tongues of fire danced upon his shoulders as he spoke, I would believe it." "Your honor, I ask no mercy, I plead for no immunity. I realize that finally the right must prevail. I never more fully comprehended than now the great struggle between the powers of greed on the one hand and upon the other the rising hosts of freedom. I can see the dawn of a better day of humanity. The people are awakening. In due course of time they will come into their own. "When the mariner, sailing over tropic seas, looks for relief from his weary watch, he turns his eyes toward the Southern Cross, burning luridly above the tempest-vexed ocean. As the midnight approaches the Southern Cross begins to bend, and the whirling worlds change their places, and with starry finger-points the Almighty marks the passage of Time upon the dial of the universe; and though no bell may beat the glad tidings, the look-out knows that the midnight is passing– that relief and rest are close at hand. "Let the people take heart and hope everywhere, for the cross is bending, midnight is passing, and joy cometh with the morning." "Your Honor, years ago I recognized my kinship with all living beings, and I made up my mind that I was not one bit better than the meanest on earth. I said then, and I say now, that while there is a lower class, I am in it, and while there is a criminal element, I am of it, and while there is a soul in prison, I am not free."